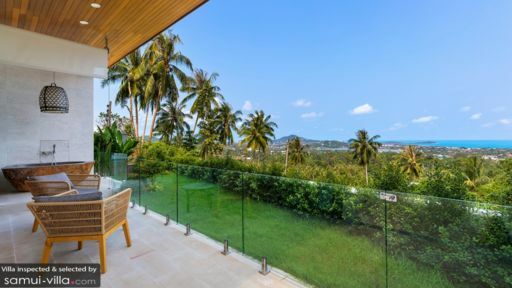 A stunning luxury retreat amidst the most popular area in Koh Samui i.e. Chaweng, Villa Asi redefines tropical living with cutting-edge architecture, lavish interiors and unique landscaping. With six, en-suite bedrooms, the villa invited large families and groups of travellers to come and enjoy the many comforts afforded by this slice of paradise. 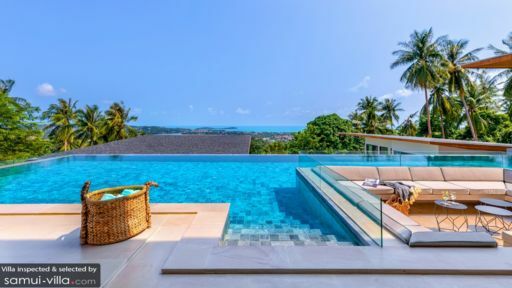 Split-level infinity swimming pool and design provides unmatched views of the ocean from each corner of the villa. You have all that Chaweng has to offer within reach in case you do wish to leave the abundance of luxuries at the villa. Villa Asi prides itself in incorporating the play of natural light with verdant nature in its interiors. The six bedrooms are each designed towards the mesmerising panorama that encompasses the ocean and the blue skies visible from the floor-to-ceiling glass doors. Designed with light wood for a bright ambiance, minimal décor save for traditional prints as seen on the bed, striking artwork and unique mirrors, the bedrooms are ravishingly beautiful. They are air-conditioned with temperature control and fitted with Smart TVs for your entertainment and comfy lounge chairs. The ensuite bathrooms are as luxurious with outdoor bathtubs, natural stone double vanities, rain-showers and amenities like toiletries and bathtubs provided. As you step through the antique wooden doors, you are greeted by two oriental vats, ponds and a pergola roof. Suitable for families with children, Villa Asi delivers fantastic services and amenities including two infinity swimming pools complete with a shallow area for your kids to play securely. The gardens are as lush as they come with varieties of flowers blooming in the tropical warmth. Nestled amidst hordes of palm trees and a lush landscape, the villa is a sweet escape into abundant nature. The sand-washed pool deck is lined with rattan recliners for your tanning sessions. Plenty of space for you to relax outdoors including the outdoor lounge and alfresco dining, each made using all-natural material like bamboo and jute. Contemporary design with interiors straight out of a guide to elegant living, the living areas are sophisticated, functional and enticing. They invite you to take a rest on the natural-wood finish sofas while full-length glass doors offer spectacular views of the bay. The high ceiling is designed with jute-pendant lighting, spot-lights while central air-conditioning units keep the spaces calm and cool. Designed with an artistic flair, the living spaces are decked out in all their livery with elements that describe the ocean, beach and the warm sun. You have access to an indoor bar complete with a fully-stocked setup, a BBQ grill as well as a dining area for twelve people. You can relish a hearty meal prepared by the professional staff at Villa Asi wherever you please, be it poolside, on the terrace or even in the comfort of your living room. The soft lighting lends a charming quality to each space that can be used to spend quality time with everyone. The kitchen is where the magic happens as it is equipped with everything you can imagine to be state of the art. The exclusive and high-end interiors at Villa Asi are made all the more enticing thanks to the dedicated staff who will offer their services to make your stay worthwhile. Their warm hospitality will leave you speechless and know that you can rest easy knowing the villa manager takes care of everything. Modern comforts are many at Villa Asi including international TV, a gym and WIFI. 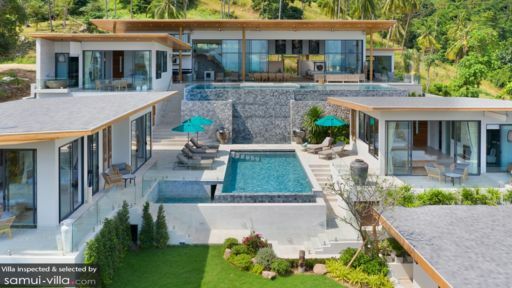 If you’re looking for a quiet retreat where you can enjoy indulgent massages by the ocean or just to relax in your private villa, then Villa Asi is for you. However, if you seek adventure and wish to engage in water activities like surfing, diving and snorkelling then too Villa Asi is the right choice. It is close to popular beaches like Chaweng that may be your gateway to all things tropical. Beachside dining at restaurants like Noori will prove to be a great experience while a drink at a beach bar like Green Mango Club is another must-do activity.